In a medium skillet, sauté diced onions and red peppers for five minutes. In another skillet, brown the ground beef a few minutes. Add the cumin, chili powder, paprika, coriander, turmeric, oregano, salt and red pepper flakes. Continue to sauté until beef is cooked through. Add chicken broth and simmer a few minutes to combine all those Tex Mex flavors. Add the corn to the onions and red peppers and heat through. Meanwhile make Avocado Crema – combine the avocado, mayonnaise and sour cream. Blend well, adding 1/4 teaspoon salt and 1/4-1/2 teaspoon chili powder (depending on your preference). Heat the black beans and tortillas. 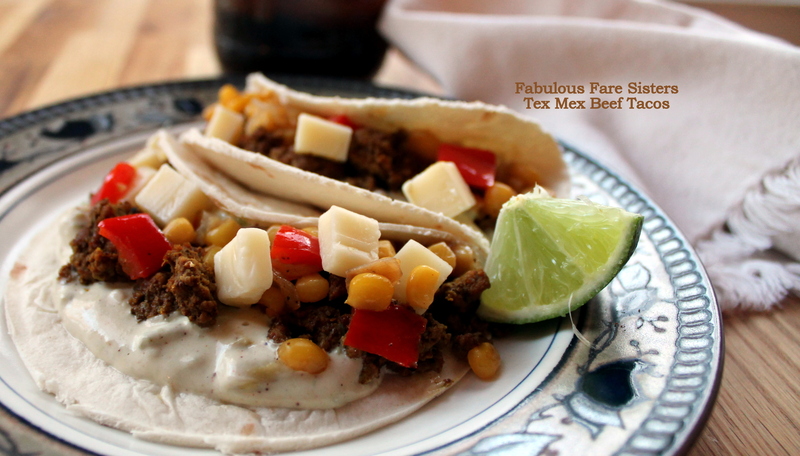 To assemble Tex Mex Beef Tacos: Spread the Avocado Crema on heated tortilla, top with spiced cooked beef, corn mixture, black beans & chunks of Queso Fresco or white cheddar cheese. Squeeze a quarter of lime on each taco. 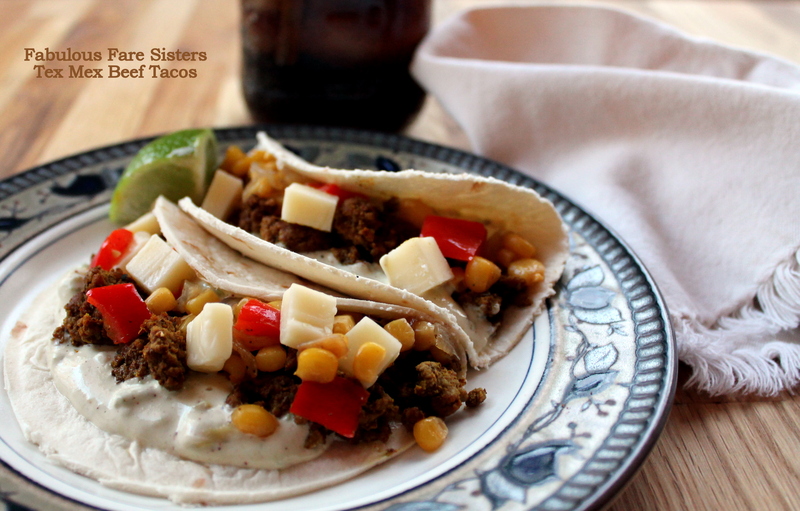 We love Taco Tuesday at my house and this recipe is going to be on next week’s dinner table for sure! Sounds delish! Thanks for sharing at Inspiration Thursday! Love your tacos Linda! Thanks for bring this goodie to Angie’s party this week! Thanks for sharing at the salon. Again, beautiful food styling. I am how about you? haha yes that is exactly the weather we are having! Linda I just love all of the spices in these tacos and all of the goodies too! Linda, can I just say your pictures are marvelous! I mean you’r pretty marvelous yourself but daaaamn woman! These look delish. Your photos lately have been extra lovely! Thanks Jodi! I’ve been working on my photography!! Trying to improve my pics!! 🙂 🙂 Thanks for noticing! You are making me hungry! This looks delicious!